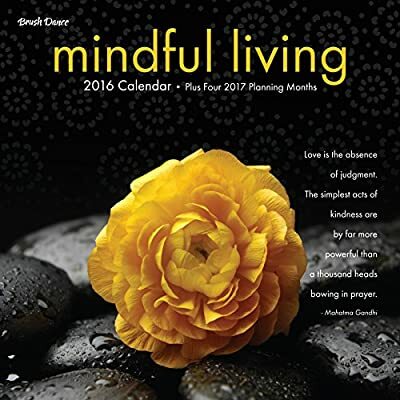 Live a more mindful life throughout the year with this calendar featuring breathtaking art and reflective words of wisdom. Monthly Quotes:January: Less is more. - Robert BrowningFebruary: Love is the absence of judgment. - Dalai LamaMarch: The purpose of life is to live it, to taste experience to the utmost, to reach out eagerly and without fear for newer and richer experience. - Eleanor RooseveltApril: Perfection of character is this: to live each day as if it were your last, without frenzy, without apathy, without pretense. - Marcus AureliusMay: Teach us to delight in simple things. - Rudyard KiplingJune: The simplest acts of kindness are by far more powerful than a thousand heads bowing in prayer. - Mahatma GandhiJuly: Happiness is not something ready made. It comes from your own actions. - Dalai LamaAugust: A stumble may prevent a fall. - Thomas FullerSeptember: Sit. Rest. Work. Alone with yourself, never weary. On the edge of the forest live joyfully, without desire. - BuddhaOctober: Silence is sometimes the best answer. - Dalai LamaNovember: Let yourself be open and life will be easier. - BuddhaDecember: Do not dwell in the past. Do not dream of the future. Concentrate the mind on the present moment. - Buddha Details and Dimensions: 12"" x 12""Durable cover and punch holeQuotes on each pageFull color artPrinted on high-quality FSC-certified paper. The FSC Mix label ensures that the timber used to produce the paper is from a mixture of reclaimed timber or fiber, FSC-certified forests and/or controlled wood.